What’s in store for your crawl space floor? Stronger than dirt. Even a wet, dirt-floored crawl space can be transformed into a clean, dry environment by installing the right materials. This photo shows dimpled drainage matting to promote soil drying & drainage, along with drainage pipe that captures seepage through walls and floor. Rigid foam insulates the walls & floor. A thick plastic air and moisture barrier covers the floor and is sealed to the wall insulation. Time to ‘fess up: It’s not easy to get the floor details right in a crawl space. This is mainly because your treatment strategies need to successfully deal with moisture, air sealing, insulation, pests and (last but not least) appearance. What you do with your crawl space floor really depends on the conditions you’re dealing with. A crawl space with a dirt floor and lots of moisture coming through the soil moves us in the direction of a worst-case scenario. We’ll get there completely if we add pests (insect & rodent), mold and wet fiberglass insulation that droops and falls onto the floor. Yes, that’s a bad situation. But it’s not insurmountable, thanks to some innovative products and the ongoing research done by the building science community. Let’s start fixing this wet, ugly, smelly crawl space. I’d begin by clearing & cleaning the crawl space floor and removing the fiberglass insulation. Although dry, intact fiberglass insulation installed between joists can be left in place, my preference is to remove this material. The fiberglass isn’t necessary if we insulate crawl space walls with rigid foam, and dry batts can provide an attractive (and hidden) habitat for pests. The next step is to install a sump pump in the lowest part of the floor and a perimeter drain system to collect ground water and transport it to the sump pump. I like the SmartPipe® drains that are part of the CleanSpace® system (shown in the photo). This specialized drainage pipe is flanged to fit against the crawl space wall, where it captures wall seepage as well as ground seepage. You get what you pay for. A cheap, lightweight poly sheet makes a poor crawl space moisture barrier. 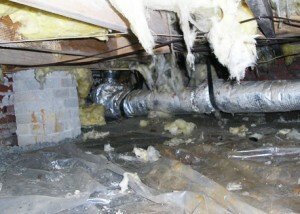 Easily torn and punctured, this flimsy film won’t effectively keep moisture out of the crawl space. For best results, use sturdy materials developed specifically for crawl space encapsulation. 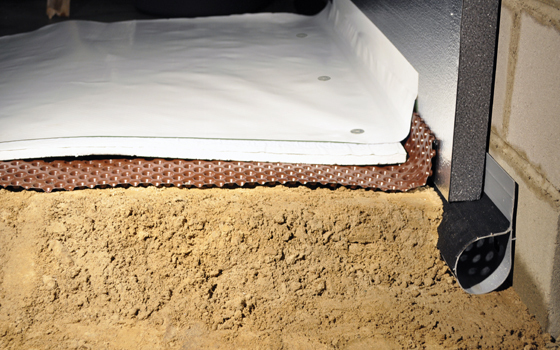 A durable, properly installed crawl space moisture barrier is one of the most important components in a sealed crawl space. 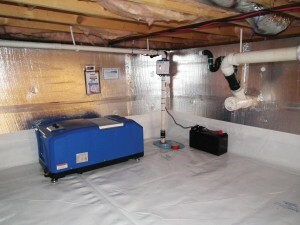 In addition to keeping soil moisture out of the crawl space, it also seals out air, pests, dirt, radon gas, and dust. Even if your crawl space has a concrete floor, it’s smart to cover the concrete with a poly moisture barrier for more complete control over the microclimate in your crawl space. Don’t install a cheap, flimsy black poly moisture barrier on your crawl space floor. The CleanSpace® moisture barrier developed by Basement Systems is a good example of a top-quality product. Its 20mil thickness and polyester cord reinforcement provide excellent durability and puncture resistance. The white color will brighten even the darkest crawl space, and the manufacturer treats the poly sheet with an anti-microbial agent to discourage mold. The moisture barrier needs to be carefully installed, with all seams thoroughly sealed with compatible heavy-duty tape. If crawl space walls aren’t being insulated as part of the encapsulation process, the poly needs to extend up the full height of the wall, then be sealed and fastened to the rim joist that rests on top of the foundation. If rigid foam insulation is in place, the poly can extend several inches up onto the foam board, and be sealed to it with tape. But make sure that the joints between foam insulation boards are sealed with tape and/or spray foam to maintain an air/moisture barrier on the walls. Dry, clean & comfortable. This crawl space was in bad shape before encapsulation and required the full treatment: interior drainage & sump pump, rigid foam wall insulation and a heavy-duty dehumidifier. The end result is a clean, controlled environment that improves comfort, energy efficiency and home value instead of negatively impacting these features. In cold climates, insulating the crawl space floor with rigid foam insulation is an extra feature to consider. It’s not as important as wall insulation but it will further reduce wintertime heat loss. We’ve already covered moisture issues that might require installing drainage and a sump pump in the crawl space. If prolonged wetness in the crawl space has made wood damp & moldy, you’ll need to run a dehumidifier to dry out the space. Get an ENERGY STAR® unit that will automatically dump condensate into your crawl space sump pump or pump it outside. If the encapsulation process has been done correctly, it won’t be necessary to run this appliance forever –just until you’ve dried out the space to under 60% RH to create a mold-hostile environment. Sign me up for the myHOMEscience newsletter! Free email newsletter & eBook! My Home Science is a blog about practical ways to make homes comfortable and energy efficient.